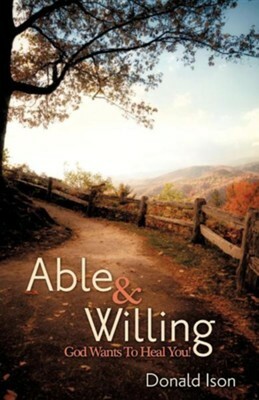 .This book, Able & Willing, will help you realize that God is not only able to heal you, but He is also willing, and wants to heal you .Discover twelve Biblical facts which prove that it is God's will to heal you .Learn how to pray with authority for your healing .Avoid these common roadblocks that can hinder you from receiving your healing .If you are desperate for a healing in your life, then you need to read this book Donald Ison, is a Servant of the Lord Jesus Christ; serving for over 35 years as a Bible Teacher in his local churches. He is now serving at the Hampton and Wolverine United Methodist Churches, in Breathitt County, Kentucky. He was a former Co-Pastor of Bach Memorial Christian Church, Noctor, Kentucky, and the Founding Pastor of Solid Rock Assembly of God, Vancleve, Kentucky. In addition, he is also a Co-Host of the daily devotional radio program entitled, "Morning Devotions," on WJSN-FM, Jackson, Kentucky. I'm the author/artist and I want to review Able & Willing.